Purple: Cut ONE (1) 3 1/2″ x 6 1/2″ strip. Purple: Cut ONE (1) 3 1/2″ square. Purple: Cut ONE (1) 6 1/2″ square. Yellow: Cut TWO (2) 3 1/2″ x 6 1/2″ strips. 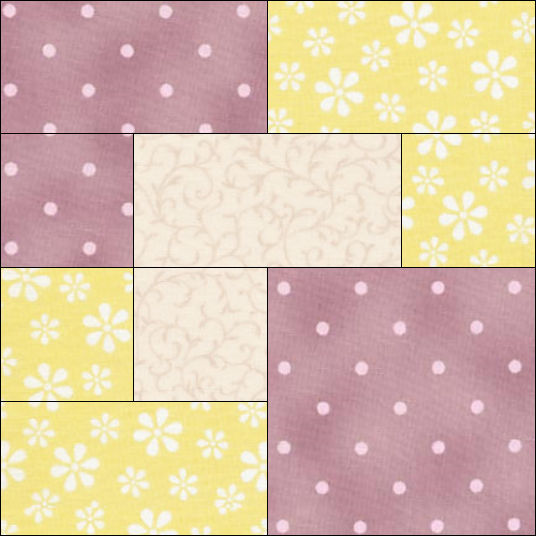 Yellow: Cut TWO (2) 3 1/2″ squares. Neutral: Cut ONE (1) 3 1/2″ x 6 1/2″ strip. Neutral: Cut ONE (1) 3 1/2″ square. Using this image (above) as a guide, sew your Rocky Road quilt block together following the suggested directions. 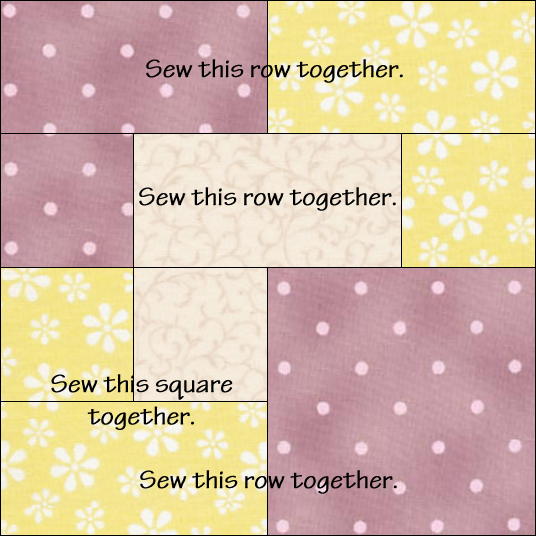 Once the top two rows are sewn together and the bottom squares are sewn together, finish your quilt block by sewing the (now) two rows to each other. Need to see a whole completely finished quilt. Not just a block, that doesn’t show what a quilt will look like. 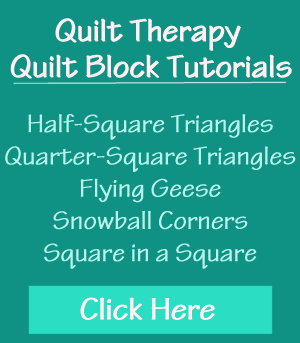 Patricia: I can appreciate where you’re coming from, however it would be an impossible task for me to go back through ALL of the free quilt block patterns that I have posted on my blog, and add a quilt design to each and every one of them. But I can certainly add a simple design going forth so you and others can see what a quilt would look like. When I am not sure how a block will look when repeated I draw it out on graph paper and colour it in. Say 3 blocks by 3 blocks. That’s a GREAT idea, Diane! Quilt on!